The latest quarterly Zillow Home Price Expectations survey asked respondents to weigh five candidates -- including Hillary Clinton, Bernie Sanders and Donald Trump in addition to Ted Cruz and John Kasich -- and their potential impact on home values and the U.S. economy's overall performance. The survey was conducted by independent research, consulting and data analytics firm Pulsenomics between April 25 and May 5, 2016, closing out just after Cruz and Kasich suspended their campaigns. The housing experts surveyed indicated their preference for candidates John Kasich and Hillary Clinton and suggested that a victory by Trump or Sanders would negatively impact home prices. When 107 economists and researchers dished on whether housing values would fare better under blue or red leadership, their average answer was neither — we’d hedge our bets on purple. That is, economists marked their resounding preference for the more centrist candidates, namely John Kasich (who has since dropped out) and Hillary Clinton, who also received mostly positive ratings from the panelists. The results come from the latest Zillow Home Price Expectations survey, which asked respondents to weigh five candidates — including Ted Cruz, Bernie Sanders and Donald Trump in addition to the favored hopefuls — and their potential impact on the housing market and the U.S. economy’s overall performance. The survey was conducted by independent research, consulting and data analytics firm Pulsenomics on behalf of Zillow Inc. between April 25 and May 5, 2016, closing out just after Cruz and Kasich suspended their campaigns (May 3 and 4, respectively). Economists foresee home price appreciation rising 4 percent by year’s end. In general, economists foresee home price appreciation rising 4 percent year-over-year at the end of 2016, compared to expectations of 3.7 percent recorded in last quarter’s survey. However, Trump’s volatility and Sanders’ strong left leanings were viewed least favorably, and survey respondents said they also would lower their expectations for the economy and the housing marketing under a now-hypothetical Ted Cruz presidency. “As the presidential election nears, candidates’ individual plans for the economy are increasingly under scrutiny,” said Zillow Chief Economist Dr. Svenja Gudell, in a press release. “Many of the candidates’ proposals sounds appealing to voters, but a closer look through the panelists’ economic lens reveals the potential impact on our economy. Interestingly, according to the Center for Responsive Politics, Clinton has raised $2.69 million from the real estate industry, more than any other Democratic or Republican contender in the race, and maintains connections with NAR’s deep pockets. “Contrast that message to her potential opponent Donald Trump who seems to revel in trashing real estate agents,” Publisher Brad Inman wrote in a previous post. Another column also touched on some of Sanders’ housing plan highlights, which include extended affordable housing for government-subsidized construction, funneling at least $5 billion per year into building and renovating 3.5 million rental units, and tax policies that support homeownership. 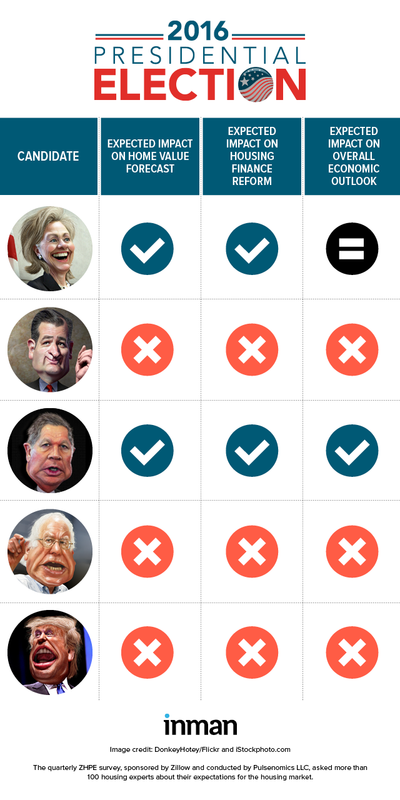 Economists favored Kasich and Clinton for their moderate leanings over Trump and Sanders. Inman compared Sanders’ idealist goals to those of former Massachusetts Governor Michael Dukakis, who offered an “intelligent dialogue” but lost to George H.W. Bush in 1988 after a “disastrous and wimpy campaign.” So while Sanders may attract a young crowd through a refreshingly detailed approach, his plans, too, aren’t likely to take off, he concluded. “It is clear that Sanders has it in for banks and would do the most harm. Clinton would at least be responsive to the [Elizabeth] Warren wing, defending Dodd-Frank. The three Republicans would be most likely to provide regulatory relief to banks. “But, as all old-time real estate people know, banks are where the money isn’t.” He argues that the most important source of U.S. real estate credit actually comes from Fannie and Freddie, who (surprise!) don’t get along well with Republicans. In that vein, all roads lead to Clinton — even one of the Koch brothers says so, a verbal endorsement of sorts that the Democratic candidate later rejected. Pulsenomics founder Terry Loebs also weighed in on the Zillow survey results. “During most of the decade that preceded the onset of the real estate bubble more than fifteen years ago — a relatively normal period for the U.S. housing market — nominal home values didn’t even keep up with inflation,” Loeb concluded. Will Bernie Sanders' affordable housing idealism go up in smoke? Is Donald Trump the real deal?